Find out how to clean cast iron and what products to use to do it efficiently. We included products and ingredients that you already have in your kitchen! From skillets and cookware to fences and tools, cast iron has played a significant role in the development of the human race for many a century. It owns its place in history for sure, but that is not to say it should stay there, it is definitely not outdated or of no use in our modern times, despite popular opinion. We may often think that considering the modern alternatives, these old products don’t belong but they do. If anything they are actually more relevant now as cast iron acts as a statement piece, it represents history, culture and won’t do you wrong with how tough and hard wearing it is. Cast iron, has the ability to laugh in the face of fragile surfaces like non-stick pans, by saying come at me with that scouring pad or steel wool, and it can do this time and again. All you have to do is put in a small bit of work to look after it. What happens though if it requires that little extra push, you’ve used it for a while, grime has built up and you need something a little more than soapy water or standard household cleaners. Maybe we aren’t talking about household items at all, instead, it may be an old-fashioned gate or fence that needs a restoration. That question is precisely what I aim to answer in this article. From a slight tarnish or food stain to scaled on rust and grime caused by external environmental conditions. Our aim is to run through methods, techniques and products with provided links for easy purchase. 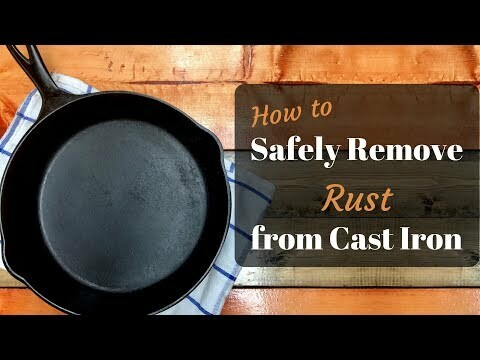 This will help the in-home user to restore their cast iron back to a state they can be proud of. Sometimes all it takes is a bit of love and attention to make something old, look new again. Perhaps one of the most common household items you’re most likely to own that is made from cast iron is the good old fashioned skillet (frying pan), or other cooking pots and utensils. At one time these were the mainstay of any house and sometimes still are, this is thanks to their toughness and long life when treated correctly that is. Cast iron tends to have a very porous surface, however, which means it absorbs matter and liquid into the rough surface, especially when warm since the iron expands, like pores on the human skin. When it cools these shrink and trap whatever was there on the surface. This causes an issue when cooking, you heat up a pan and the pores expand, once finished you leave your pan to cool, that means all those leftover food particles get trapped. Remember we aren’t only talking about food, this could be dust or dirt for other indoor items. So how do we release the grime and clean? The most gentle and easiest method is to heat up your pan or object. The same way you would when cooking with it only this time instead of oil and food apply hot water, it needs to be hot or you’ll risk cracking the metal due to rapid temperature change causing shrinking. Once hot water has been applied, use a soft-sided sponge and rub gently. Be careful not to burn yourself as the object still needs to be hot. The hot water and hot metal will allow the grim to be released and come off. Failing the gentle approach, let’s say you have something that is baked on quite thoroughly and simply heating and rubbing won’t clear it, you need something a little more abrasive. Instead of going straight for the scourer or steel wool, which will scratch the surface, we are going to try coarse salt. The salt method then does require a little different of an approach, first heat your object or pan as before, you are going to apply only a few drops or a quick splash of water. You will also need to add a generous amount of course table salt. Once you add the salt and water, use your soft sponge or half a potato, which is actually a proven method and gently massage the mixture in. Some of the salt will dissolve and other bits will break down. Salt is soft enough to not cause any damage but hard enough to effectively attack the grime. If there is still a lot of grime or rust left, repeat the process, several times if needed and use a scouring pad, steel wool or a piece of old leather to apply more friction. There are endless videos on youtube with guided instructions on how to remove grime. This is a technique that is often overlooked or simply not thought of but is actually very important for the longevity of your ironware. It takes advantage of the grain structure and traps in oil which in turn prevents rust and surface damage caused by oxygenation. The first step to seasoning and this is especially applicable to kitchenware, is to gently heat it up over a stove or put it in an oven for a self-clean cycle. Heat gently and just enough so it is too hot to touch, any higher a temperature will make the oil you’re about to apply burn off. Once up to temperature, remove from the heat and apply a generous amount of vegetable oil or food safe cooking oil. The oil will melt pretty rapidly, as it does, begin to work it generously around the pan using a lint free cloth. This is recommended over using any type of tissue paper since tissue will disintegrate and leave fluff stuck in the oil. Once the oil is applied inside and out, simply leave the pan to cool naturally, the pours will shrink trapping in the oil. This in turn will prevent rust and degradation of the metal and leave you with a freshly seasoned piece of Iron. Okay, so we have gone over a few products and methods of cleaning and treatment for the everyday user, but, what if you need something with a bit more of a kick to really scrub an object clean and then seal the surface properly. Below, we are going to compile an extensive list, showing highly rated items that are suitable for a variety of tasks with helpful sourcing links provided. These will also be sectioned off for easy navigation. Where methods for use vary from the ‘Soft Clean’ section, we shall give a brief description of how to use the item. Chainmail, sounds like something from the era of nights and nobles right? Yet here we have a proven product that is used much like the common scouring sponge you buy at any supermarket. Use this when washing your item under warm water, the hard metal surface offers a lot more friction to remove baked on grime that proves tough. This will likely scratch so be ready to re-season the surface after use. A wooden bristle brush is a useful tool to have if the chainmail is too hard going yet a scouring sponge is too light. This nifty producthas wooden bristles that effectively rips through food and grime. The other option in this category is the plastic or plastic alternative bristle brush, perhaps the major bonus with plastic is the fact it is more water resistant and easier to clean. When used in conjunction with something like this custom scraping tool, then light to medium grime won’t stand a chance. The wooden/ plastic bristles and plastic scraper won’t cause any lasting damage but as with any serious clean, seasoning should be carried out afterwards. The wire brush is the stage up from wooden bristles and means a situation is starting to get desperate. It also might be a go to tool when dealing with bigger items such as gates and fences, this is where you need to consider full restoration since rain or other environmental issues may have had an effect. Wire brushes vary in range, factors like thickness of bristles making a difference as well as bristle material. All these play a key role in what sort of material they remove and how aggressive they are. When dealing with old iron like gates, fences and other outdoors items, rust and old paint may be a big concern so harder bristles are needed. A great product to use in this circumstance is a sturdy brush . The comparison between both are primarily the bristle material, with the first being brass, this is a lot softer, giving a gentler clean while carbon steel is made for heavy use on large, less sensitive items. If a hand brush still isn’t cutting it then it is time to start and think industrial, by that we mean heavy duty, hard bristles and lots of power. That is everything these wire brush adaptors for a power drill offer. Cheaper than buying a specialist sander/ grinder since it fits in a common hand drill, these offer medium too high removal of grime and rust so worth a consider. These attachments come in a variety of grades that reflect what type of job you’re doing. Much like the hand brushes, this grade determination is usually based on the bristle material, layout and thickness. Failing the efforts of steel brushes and in home cleaning methods, the final stop for the cast is specialist care, this usually comes in the form of sand or shot blast. This process entails sand or tiny fragmented plastic being fired at very high pressure to a surface which in turn strips paint, rust and anything else on there. This process will cost and is rather aggressive so for items like gates and fences can be a great option when doing a full restoration, for pots & pans, not so much. So far, the above relates specifically to the home products like pots, pans, utensils, gates and other in items that need a clean. Generally, all these items work perfectly well with soap, salt and water. If however, you’re in a position where water simply isn’t enough to lift grime then you may need to consider a few specialist liquids, so here are a few suggested products. When undertaking cleaning it seems only logical to start first with some of the cheaper and easier methods before you reach for the strength treatments. Usually, that means soap and water, yet surprisingly, ordinary dish soap is not a friend to cast iron, despite popular belief that it does no harm. Lacking in oil and sometimes containing citrus or other acidic extracts, both these chemicals can lead to corrosion in the metal. This is where specialist soaps should be considered. Containing natural vegetable oil it is a fantastic option for cleaning cast. Once you have cleaned an item through whatever means seem most relevant, you then need to do something with the surface, the type of finish depends largely on the final use of an item. If we are talking about pots & pans or other cooking apparatus, a surface finish in the form of oil will be needed. Although vegetable oil will work fine, there are advantages to specialist oils. Some offer a better, more lasting protection. Use these oils in the same fashion as stated in the seasoning section, unless otherwise instructed. One of the key factors when restoring something like a gate or fence is to make sure you can work on it safely and most importantly, you can do all the work in one go. Once you start and remove rust you leave fresh metal exposed to the elements which will then degrade faster. Once you have cleaned off the bad areas, you need to treat the surface using some sort of rust converter. Using a rust converter will not stop rust forming again so straight after, a coat of primer or paint must be applied. What it does offer over painting straight onto bare metal is the knowledge that you are now painting on a completely fresh, treated surface with not rust underneath to bubble and ruin any new paintwork when applied. We hope this article has helped to provide a few useful guides and links on taking care of cast iron. I think whether you are considering buying new, inheriting a piece or even found an old item out rusting in the garage or jumble sale, cast iron has the potential to be restored from almost any condition, it is durable and very hard wearing with the ability to look after you as long as you look after it. We know that there are also some concerns regarding health when talking about cookware, the thought of the iron going into the food you prepare for one. I can tell you that these concerns are not valid. Iron is essential in our bodies and helps with carrying oxygen from our lungs, around or circulatory system. So the added bonus of the minute amount that may get into food will only benefit us. In general, cast iron was once an essential part of human growth and evolution and I think to see it as something that has had its time would be a big mistake.